The odd thing about an athletic director search is it's extremely difficult to examine what it is precisely a university president, especially a new university president is going to be looking for in a new AD. Its not like a coaching search where you have things like past success, wins and losses, graduation rates, etc...to go from. Athletic directors are judged by a much broader criteria. But ultimately, like any job opening, it comes down to who is going to be the best fit. For Dave Brandon, he came into his AD role in 2010 with an impeccable resume of business success. The athletics budget at Michigan has increased dramatically during Brandon's brief tenure. Most of what made Dave Brandon a good AD was mostly hidden from the public. What we saw and heard from the outside however, was just the opposite. I'm not going to turn this column into a diatribe about what Brandon did wrong. While he did do some things right, he obviously made a lot of mistakes, which he paid for with this job and his public reputation. I'm not going to pile on. What's done is done. It's time to move on. Michigan's current AD opening comes with one huge caveat…the new guys will either have to fire the current head football coach and hire a new one, inherit a coaching vacancy, or inherit a new coach. Ideally, Michigan would have a new AD in place before the end of the season (with or without a bowl), but as we're hearing from various sources, president Mark Schlissel seems to be in no hurry – which leaves interim AD Jim Hackett with the power to do as he pleases until a new AD is named. According to what I'm hearing, Michigan is hopeful to have someone in place by mid-December. There are a few names floating around out there…some bigger than others, so let's break them down. Maybe the current favorite to replace Brandon, Bates is the current athletic director at Boston College, a post he's had for the last 2 years, at Miami (NTM) for the 10 years prior to that. A native of Port Huron, MI, he graduated from Michigan in 1981. He was a football walk-on under Bo before earning a scholarship. He has a masters in education from Michigan (82) and a doctorate in education from Vanderbilt (98). Current Vice Chancellor and Director of Athletics at Arkansas since 2008. Former AD at Pitt. Also held various administration positions at Oklahoma, Michigan, Virginia Tech and Eastern Kentucky. Replaced Frank Broyles at Arkansas, and immediately hired controversial coach Bobby Petrino, whom he fired in 2012 following revelations of his affair with a former Arkansas volleyball player. Long then hired Wisconsin's Bret Bielema which many considered a great hire after such an ugly situation with Petrino. Current AD at UConn, a position he's had since 2012. He was AD at Buffalo prior to that from 2005-2012. Prior to that, he was an associate AD at Michigan. Manuel graduated from Michigan in 1990 and played under Bo from 1986-89 as a defensive tackle. Manuel's ties to his alma mater make him a shoe-in candidate, but according to the Hartford Courant, as of last Sunday, Manuel has not yet been contacted by Michigan about the AD job. Current AD at Arizona where, yes, he hired Rich Rodriguez in 2011 after he fired Mike Stoops. Greg has no ties to Michigan. Prior to Arizona, he was the AD at Mississippi State from 2008-2010, where he hired current MSU coach Dan Mullen. The AD at Oregon, Rob Mullens is likely a long shot for Michigan. He's been in Eugene since 2010. There are only loose reports than current Oklahoma AD Joe Castiglione is being considered for the Michigan job, but its at least worth noting that the speculation is out there. Hired away from Michigan in 2011 by Texas Tech AD Kirby Hocutt to serve as his deputy AD, Joe Parker now finds himself on the list of potential candidates to come back to Ann Arbor. While Michigan will likely try to find someone with more head AD experience, you can't discount his experience at Michigan as a benefit. The current Central Michigan AD appeared on the radar last weekend when it was reported the he'd been contacted by UofM about the open position even before Brandon resigned on Friday of last week. Heeke has been at CMU since 2005. Prior to that he worked at Oregon as a senior associate AD/chief of staff. In 2013, Heeke was appointed to the Division 1 Athletic Directors Advisory Group…one of 11 ADs in the country to be selected. And this year, he was named chair of the NCAA Division 1 Baseball Committee…and last year he was on the Division 1 Football Issues Committee. Current AD at Northwestern with no Michigan ties whatsoever, he was first reported to have been targeted by Michigan according to ESPN's Joe Schad last Saturday. Phillips is a graduate of Illinois in 1990, he's been at his AD post at NU since 2008. It was Phillips who is credited for keeping Pat Fitzgerald at NU while Michigan was reportedly attempting to hire him to replace Rich Rodriguez in 2010. Phillips is the current president of the National Association of Collegiate Directors of Athletics. He also spent two years as the Athletic Director Chair of the Big Ten Conference. Well, the current Michigan interim AD deserves at least a mention on this list since it is likely he who will be making some sort of decision about the future of Brady Hoke. I seriously doubt Hackett will pursue the position as his task here is to serve as interim AD and nothing more. 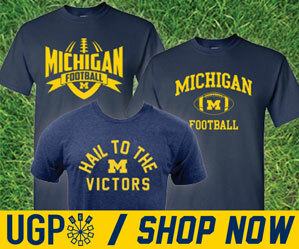 Hackett, the former Steelcase CEO who retired this year does not seem to fit the mold Michigan seems to be looking for in a permanent AD. It seems apparent that Schlissel and the Regents do not want another CEO-type of leader for the department, but instead would like to find a candidate with a background as an athletic director. The article says that Brandon "took a department which was losing money, and turned the ship around with ease." Actually, the dept. became profitable again under Bill Martin's watch. You are correct, that was my mistake. Fixed.